Rukn-al-din Barbak Shah was the ruler of Bengal Sultanate, he was the son of Sultan Nasiruddin Mahmud Shah, during the reign of his father he was appointed as governor of Satgaon. He sat on the throne of Bengal Sultanate after the death of his father in the year 1459. He ruled Bengal Sultanate from 1459 CE till 1474 CE. Rukn-al-din Barbak Shah was a patron of scholars and poet, both Muslim and Hindu scholars. He is well known in recruiting eight thousand Abyssinian slaves and also employed in the army if Bengal Sultanate in various posts. He is also remembered as a good administrator and lover of justice and kind-hearted. During his reign, many Hindu played a prominent in both his civil and military administration. This silver tanka issued by him weighs around 10.58g. The obverse of this coin is inscribed with ‘Shahada within the central circle’ and the name of Rashidoons and their title written in the margin. 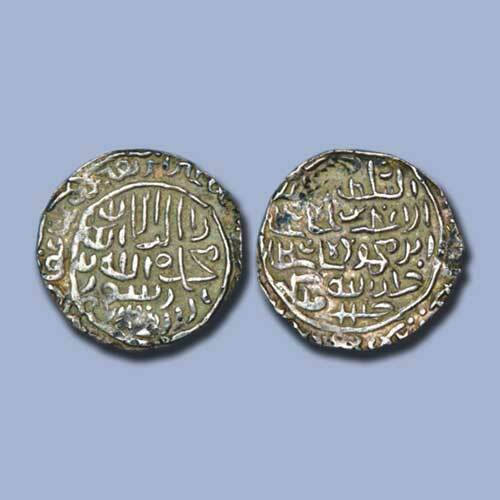 The reverse of this coin is inscribed as ‘Al-Sultan Al-Adil Al-Azam Barbak Shah Sultan Khallada Allah Mulkahu Wa Sultanahu’ within the circle.